The best thing about Quentin Tarantino is also the worst thing about Quentin Tarantino—he believes, wholeheartedly, in whatever he’s doing. Most of the time, what he’s doing consists of overly referential homage mashups with dialogue that would give most screenwriters carpal tunnel. The old video store clerk is sublime at saying important things through mediums that don’t usually convey them—Kung Fu films, revenge fantasies and spaghetti Westerns, for starters. He is an artist dressed as a Philistine, splattering the screen with cartoonish violence when what he’s really blowing is our minds. This works, works well, and works often. The House of the Blue Leaves sequence in Kill Bill Vol. 1. The casting of Samuel L. Jackson and a pre-comeback John Travolta as buddy thugs in Pulp Fiction. Pretty much all of Reservoir Dogs. And just as his work always has context, so are each of his films compared to his previous creation. Which brings us to Django Unchained, the big, bloody tale of a slave’s revenge starring Jamie Foxx as the titular blaxploited one and featuring the welcome return of Inglourious Basterds’ savior, Christoph Waltz. Tarantino’s latest effort isn’t his best, it is his most ambitious, and for someone capable of so much, that means quite a lot. The rest of Tarantino’s canon is chock full of stories that play with narrative structure like a cat with a ball of yarn—batting it back and forth in anything but a straight line. Django Unchained is not so crooked. In fact, on the surface, it’s relatively straightforward—a white bounty hunter teams up with a freed slave to hunt down some deserving white boys and find the ex-slave’s wife in the process. In terms of linear storytelling, this is the closest to it that Tarantino has ever come. But, instead of playing with time, here he toys with everything else—white guilt, blaxploitation, violence as catharsis, slavery, and especially the idea that a rich white man could make an outraged, outrageous film about the oppression of an entire people and the repression of the memory of it. He shakes his bloody fist at the injustice of it all, and that fist is usually wielding a camera as a weapon. This is, in many ways, a spiritual sequel to Inglourious Basterds, another film that revises by putting a bludgeon in the hands of the historically oppressed and gives power back to the powerless. Instead of turning cinematic expectations on their head, the director has now turned his keen, instigating eye toward history, finding things that make him angry, and then trying to get us to share his anger. 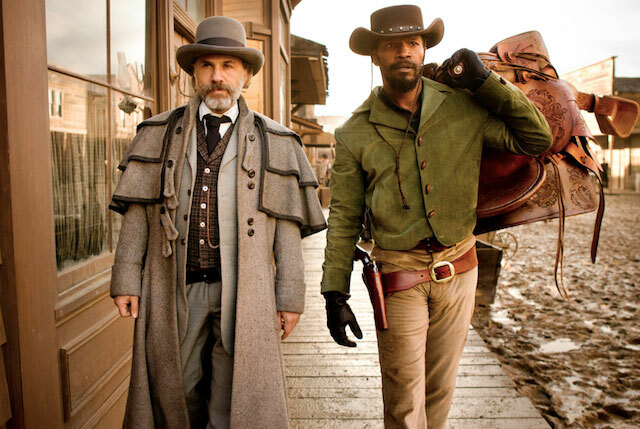 The man who should be angriest here is Foxx as Django, unchained and ready for revenge on those who have wronged him. But he plays the slave-turned-bounty-apprentice at a slow burn, smoldering and quietly powerful rather than bombastic. Perhaps Will Smith’s backing out of the role left Tarantino with less passion for his silver medalist. Either way, as is often the case in Tarantino films, the more interesting roles can be found with the supporting players—here Samuel L. Jackson, Leonardo DiCaprio and Christoph Waltz. But the man who steals the show here is Samuel L. Jackson’s house-slave, Stephen. Tarantino loves working with him, whether as the philosophical centerpiece of Pulp Fiction or an off-screen piano player in Kill Bill. And in Stephen, Tarantino has written a role that only Jackson could get away with. He is the ultimate Uncle Tom, spreading his Stockholm Syndrome to anyone who will listen. It is daring, offensive and emotionally accurate. It is a whip across the back of anyone who dares tell Tarantino that we live in a post-racial society. He pulls no punches because he is most comfortable in the middle of a fight, whether that fight is physical or psychological. Tarantino wants this to take a toll on our psyche. Otherwise, he hasn’t done his job. Here, Jackson does a lot of the work for him. Jackson’s character is an ideal vehicle for Tarantino’s gleefully unrestrained, filter-free cinema, but that doesn’t mean that the editing floor could not have used a thicker coat. One feels the near-three-hour runtime of Django, not because it is wholly unfocused (only occasionally), but because the director suffers from a heavy dose of Spielberg-itis—his respect for the source material (or, in this case, source influences) is so great that he refuses to diverge from it. His overindulgence is on full display, but his encyclopedic knowledge of cinema (especially the obscure) keeps things bloody and fresh, for the most part. There are more deaths and homages here than the In Memoriam segment of an awards show, but that’s the genius of Tarantino. He no longer just speaks lovingly of the greatness he used to consume. He’s creating it now, speaking his own new language of “intercinemality.” His oeuvre is under the constant influence of his past, but he’s not asking us to look up each nod to Italian Actor A and Dutch Composer B anymore (although they’re still there, winking at us). He’s learned that while he can still paint his picture in blood red, the background is just as important, and the heavily layered depth of Django Unchained is a triumphant testament to that.